I have wanted to design this pinnie pattern for years and finally, here it is! It’s a pull-on pinafore that ties under the arms and has sweet little ruffle “sleeves”. The pieced bodice is the perfect place for embroidery, monogramming, or showcasing a motif from your fabric’s print. Apron-front can have optional pockets with adorable bias trim. Recommended sewing experience: Beginner/Advanced Beginner. This listing is for the pinafore pattern ONLY, no underdress pattern is included. 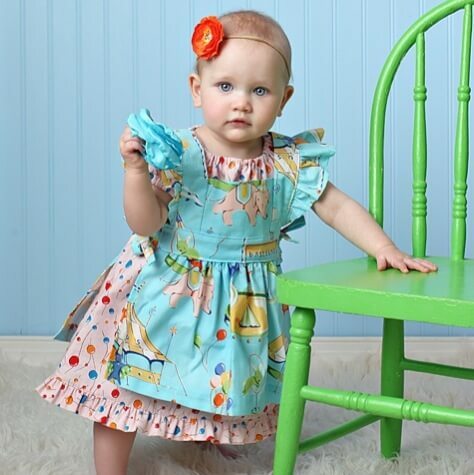 See my other listings for the Easy Peasy Peasant Dress pattern and Baby’s Party Dress pattern shown beneath. Pinafores have been worn for centuries. You’ll recognize them from Alice in Wonderland, Dorothy in Oz and other favorite storybook characters. Real children wore them all the time! They were worn as a protective apron that could be easily washed, keeping the fancier dress beneath (that may have had buttons or ornate stitching not easily washed) clean. The pinafore was “pinned” to the front, or “fore” of the dress, and thus called the ‘pinafore”! No fasteners to worry about in the wash.